If you ever lose your way in a sandstorm, the Desert Nights Casino will gladly guide you back home. 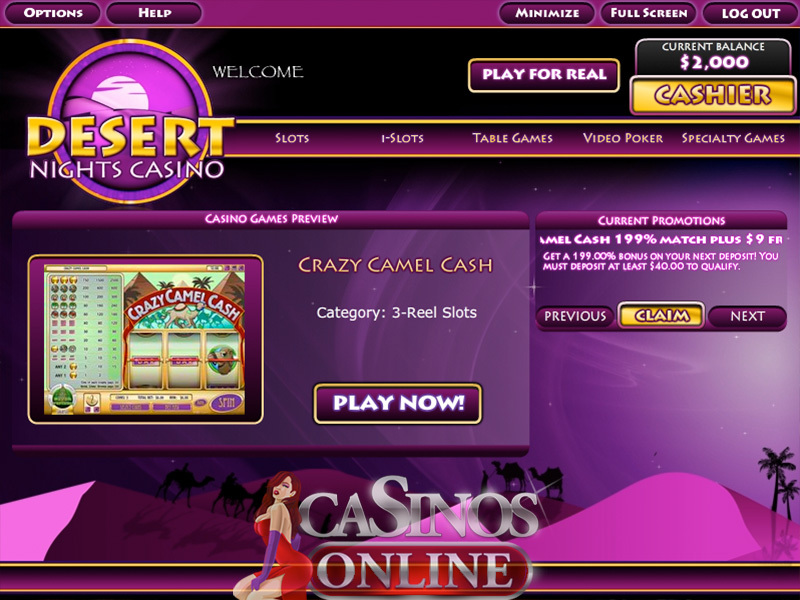 With a theme that matches a real life casino, the website was designed to have a unique experience with gambling. 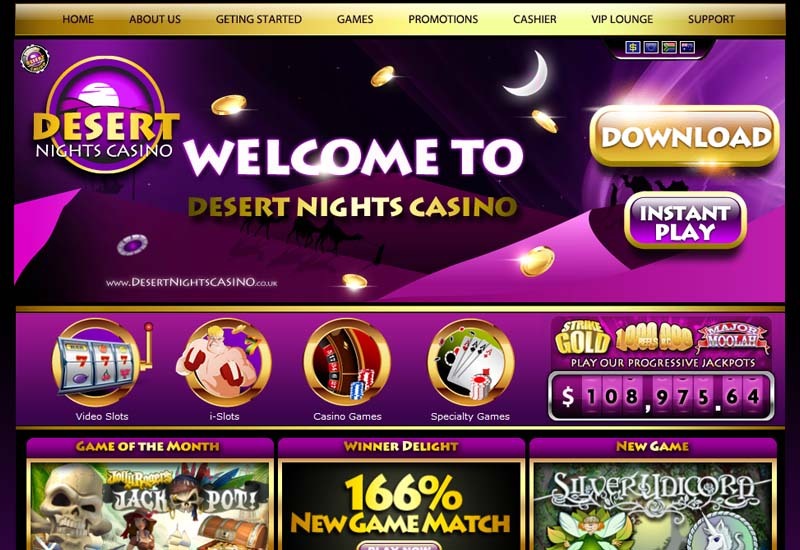 By moving to the RTG software platform as the main supplier, the casino enabled many excellent titles to be added in the collection of games. The website enforces certain security protocols like the data encryption technology, which allows to guard the data from any kinds of malicious activities. The brand is licensed by the Central Government of the Netherlands Antilles. 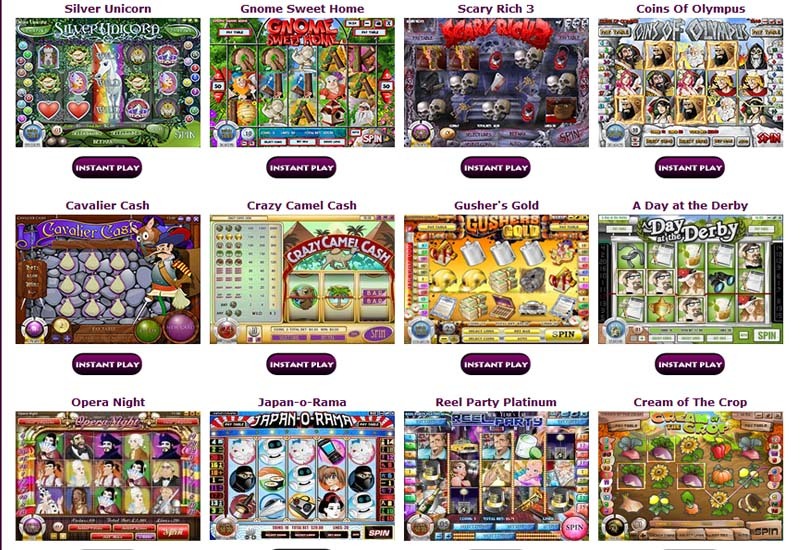 The promotions are being granted in many forms, like the Welcome Bonus given on the first eight deposits. * Players from the following countries not allowed for no deposit bonus: Albania, Armenia, Azerbaijan , Belarus, Bosnia and Herzegovina , Bulgaria, Croatia, Hungary, Kazakhstan, Kyrgyzstan, Latvia , Lithuania, Macedonia, Moldova, Montenegro, Poland, Romania, Russia, Slovakia, Slovenia, Tajikistan , Turkmenistan , Ukraine, Uzbekistan..
At the Desert Nights Casino, both forms of gameplay are available – instant version and downloadable form. All the newest releases as well as golden classics can be played on the website, giving many options to choose from. Plentiful Slot Games are waiting for the players, with great titles like Aztec’s Millions, Return of the Rudolph and Basketbull. Table Games cover a variety of standard games, such as Roulette, Blackjack and Poker. Specialty Games include some of the most successful: Bingo, Keno and Scratch Cards. Video Poker is also a popular choice and the Progressive Jackpots can score very attractive prizes.